The Exotic Shorthair is one of the most loyal and affectionate breeds of cat. They love affection and being near people. Unlike their Persian cousins, the Exotic Shorthair Cat is willing to have a bit of fun once in a while. It’s cute face and dense coat give it a teddy bear appearance that can hardly be resisted. The Exotic Shorthair cat is a fairly new breed, having only been developed in the 1950s. Breeders of the American Shorthair sought to obtain the texture and color of the silver Persian, without the required grooming of the latter. In 1966, Jane Martenk proposed the creation of a new breed, which quickly became popular for its looks and personality. At first, the only color was silver, but all colors were written into the Cat Fanciers’ Association breed standard right from the beginning. The standards were, for the most part, the same as for the Persians, except for that lovely medium-length coat. In the beginning, American shorthairs were crossed with Persians to obtain the desired look and coat. However, outcrosses haven’t been allowed for Exotic Shorthair breeding programs since 1975 because the gene pool was found to be large enough to reliably produce healthy cats of the type sought for by the breed standard. 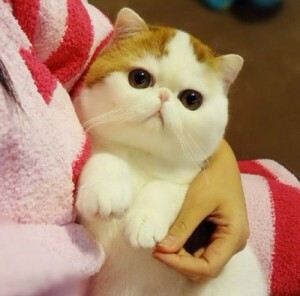 Today, Exotic Shorthair cats are only breed with Persians, and new colors can only be added if the CFA board and the Exotic board agree upon it. Sometimes referred to as a “Persian in a petticoat,” the Exotic Shorthair cat has many of the physical characteristics of the Persian, but without the long coat that gets matted if not groomed regularly. Instead of the long coat, the Exotic Shorthair has a medium, dense coat with a thick undercoat which is nearly shed-free. The overly dense coat and undercoat make the Exotic Shorthair look larger than life, which is saying a lot because this is no small cat. The Exotic Shorthair cat can weigh as much as fifteen pounds. However, it has the short, stout legs of a Persian. With dense bones and a muscular physique, it is clear the Exotic Shorthair cat is compact, not fat. Moving upward, one will find an impressively large head with short ears and a shortened muzzle. 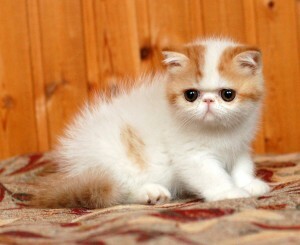 Large, round eyes complete the kittenish appearance of the Exotic Shorthair’s irresistible face. Behind, there is a short, thick tail. To add to all this, the Exotic Shorthair cat has a quiet, kittenish mew that is rarely heard. The Exotic Shorthair cat started with only a single color, silver, but it has branched out far beyond anyone’s expectations. The rainbow of colors includes white, black, grey tabby, red tabby, and so much more. There’s even a pointed coloration that looks similar to that of a Himalayan. The most popular colors today are black, tortoiseshell, red tabby, and brown tabby. The Exotic Shorthair cat is by no means a loner. It loves human contact and is often a lap cat. However, it also requires time to find places to cool off, such as uncarpeted floor, brick, or tile, due to its dense coat. The Exotic Shorthair often enjoys following its owner around and then settling down for a nap when its owner settles into one place. More playful than the Persian, the Exotic shorthair cat enjoys the simple toys, such as a piece of string or the lights created by a prism, but its activity level is not as high as the American Shorthair. Their calm, easygoing nature makes them a great companion pet for almost anyone. With the Exotic Shorthair, there is no worry of jumping or running around the house, because this breed of cat is too gentle for that. Keep in mind, though, that the Exotic Shorthair does not like to be left alone for long periods of time, which is why many owners leave the radio or television on if they are going to be gone. Because of its gentle nature and love of people, the Exotic Shorthair is truly the best all-around cat for just about anyone. These cats get along with children and dogs, live easily in urban or rural settings, and make the best companion cat to suit everyone.